Reader to Reader: Do you give preference to stocking your salon's retail boutique with items that are made in the U.S.A.? 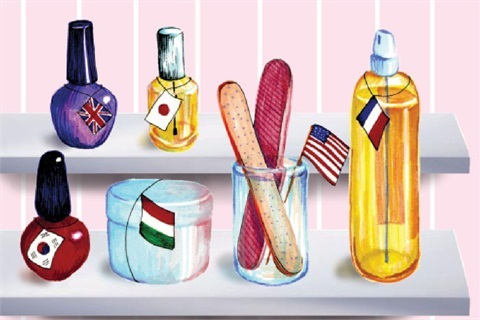 Do you give preference to stocking your salon’s retail boutique with items that are made in the U.S.A. (or in your native country, if you aren’t in the U.S.)? No, but we should! That would be so difficult though. I once made it my New Year’s resolution to not buy anything made in China. Well, needless to say, I saved a lot of money because every time I went to the store (for anything really) all the tags said the items were made elsewhere. I think America makes great quality items, but we import so much that American-made items are difficult to find. I only made it to April before giving up. I stock my salon with handmade products. I think local, not just U.S., is the way to go depending on what retail you would like to carry. Graffiti Nail Bar, Memphis, Tenn. I use and offer products that are as local as possible. I believe in supporting my community and, in doing so, I am able to make sure they are of the highest quality because I get to know the creator and where they get the ingredients to make their products. I stock what I use and what sells. I selected companies that I have faith in and whose products are high-quality. That being said, I haven’t looked into where they are made. Parisian Nails of Sequim, Sequim, Wash. I buy handmade products and make jewelry myself. I definitely give preference to products made in the U.S. In fact, starting last fall all of the new products that I bring in are made in the U.S. Our country has a wealth of talent, and I love supporting other small businesses and artists. My clients appreciate the thought I put into my boutique, so we can all feel good about where our money is going. Panache Nail Studio, Stanwood, Wash. I like to stock my area with products that my clients need, regardless of where they are made. I would not mind paying more for products if I knew they would help clients’ nails. I don’t have a retail area in my current salon yet. But I buy American-made (and even local if I can) for the products I use in my services. I like knowing where my products come from. And if I know the actual person, that’s even better! New Image Salon, Arcadia, La. I was thinking about converting from booth rental to commission. What do I need to know?